Join PocketWin Casino as we embark on an epic journey to a far-away land in Golden Empress online slots! It’s a place where intrepid mobile slots explorers may be rewarded with the mysterious ruler’s riches, so if you think you’ve got what it takes to impress the Empress, read on! The enigmatic Empress has more gold than you could possibly imagine, but will she decide to share it with you? 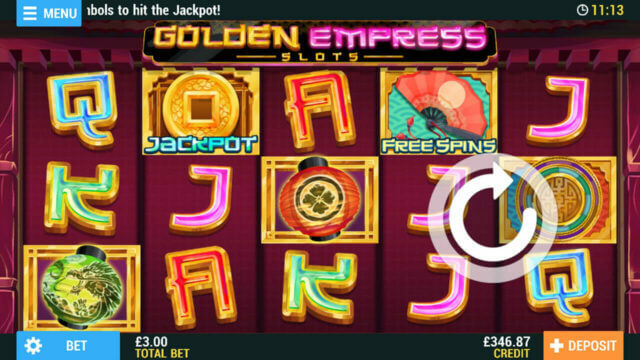 Golden Empress Slots is fixed to 15 win lines, has a revolutionary mini-game and of course, a blossoming progressive Jackpot that will keep growing until a worthy winner takes it all! Will you win big in the land of the rising sun? You’ll need a device running iOS 10 or Android 5.0 and above to give this mobile slots spectacular a spin and see if the Empress takes a shine to you! Your quest for gold is about to begin, but first you’ll need to set your bet per spin. Press the blue ‘Bet’ button to the bottom left of the screen and you’ll see your options laid out before you. Use the ‘+’ and ‘-’ buttons or scroll up and down to choose how much you’d like to bet per line. As Golden Empress Slots is fixed to 15 win lines, this value will be multiplied by 15 to determine your total bet. As you adjust your bet-per-line, you’ll see your total bet automatically update above. You can choose any bet-per-line from 1p up to £10. So, let’s say you bet 10p. That’s 10p x 15 which makes your total bet £1.50. If you decided to bet 50p, your cost per spin would be £7.50. When you’re happy with your total bet, click the downward arrows to return to the reels. You’ll still see your total bet amount displayed in-game alongside the ‘Bet’ button. Then all you need to do is press the white circular arrow to spin! There’s a lot to see in this exotic land, so you might want to take advantage of the Empress’ clever ‘Auto Spin’ feature! You’ll find this by pressing the ‘Bet’ button and then selecting ‘Auto Spin’. Set your number of spins and decide on a minimum credit level that you don’t want to fall below. Auto Spins will stop if you reach that minimum level or when all your spins are finished. You can also set it to stop if you have a single win that exceeds your chosen amount. After you hit ‘Start’, the reels will continue to spin automatically and you’ll see how many spins are left in the white square on screen. Press ‘Stop’ to return to manual play. When you’re ready to play, press ‘Spin’ and the reels will begin to roll, before stopping at random. How many matching symbols do you need to spin on an active win line? That depends on which ones they are! You can win with just 2 or more of some symbols, while with others, you’ll need at least 3 to earn yourself some of the Empress’ gold. The Empress has a few golden rules in her palace. The first is that her win lines always pay from left to right. The Empress will only allow you to win once on each line, so only the highest win on any individual line will be paid. However, if you’re lucky enough to win on multiple lines in a single spin, she will add all of your wins together to give you one fan-tastic prize. All of the Golden Empress’ symbols come with different multipliers, and the more matching symbols you manage to spin, the higher that multiplier will be! When you win, the Empress will multiply your original bet-per-line by whatever the symbols you lined up are worth. Tap the ‘Menu’ button in the top left corner and then select ‘Paytable’ for details of how much each combination of symbols is worth and how many you’ll need to win. Whenever you get lucky, she will highlight your winning lines and show the amount you’ve won on screen. Then she’ll take your win amount from her stash of gold and automatically add it to your credit. Spotted a lotus flower on your win line? It sure is pretty, but it’s also pretty useful! Those Wild symbols can take the place of almost any other symbol, potentially turning a losing spin into a win. For example, if you had two Q symbols on your win line with a Wild in between, the Wild would magically act as a third Q symbol, awarding you a win worth three Qs! However, the Empress has ruled that her progressive Jackpot cannot be won with a Wild in place of a Jackpot symbol, and they also can’t stand in for Free Spins or mini-game symbols. Still, for a flower, those Wilds have a lot of power! To access the Golden Circle mini-game, you’ll need to spin 3 or more of the mysterious golden wheel symbols anywhere on the reels. Just hit the ‘Spin’ button to start! When the wheel stops, if the pink arrow points to a prize, you’ll win it and return to the reels. If it’s a multiplier, you’ll win your original bet multiplied by that amount. Get free spins and you’ll receive that number of free spins as soon as you return to the reels. If it points to another pink arrow, the inner wheel will begin to spin automatically. Again, you’ll win the multiplier you land on and return to the reels. However, if you land on a pink arrow AGAIN, you reach the final wheel, where you can win a huge haul of free spins! If you win free spins on the Golden Circle mini-game, you’ll get to play for the Empress’ gold without paying to spin! As soon as you return to the reels, you’ll receive the amount of free spins shown on the winning segment of the wheel. You can also earn 5, 7, or 9 free spins by spinning in 3, 4, or 5 Free Spins symbols respectively. They can appear anywhere on screen, and don’t have to be lined up on an active win line. While your free spins are in play, you won’t be able to alter your bet-per-line – that will always stay the same as the spin you won them with. However, as the Empress is footing the bill for them, you won’t pay a penny until your free spins have been used up. The game Jackpot seed value is £2000. The Jackpot is individual for this game, it is not shared with any other games. In the event of a communication error after a progressive win result has been determined and before it has been displayed on screen, the win amount will automatically be transferred to the player’s account. While the game is live, the Jackpots cannot be terminated. Golden Empress Slots has a theoretical return to player of 94.59%. This is based on long term playback. System malfunctions void all payments. Monies are staked in the following order: winnings, player deposits, bonus credit.